China and Russia should continue to maintain their high-level strategic coordination within the Shanghai Cooperation Organization (SCO), Chinese President Xi Jinping said in the southwestern Russian city of Ufa Wednesday. Xi made the remarks during a meeting with his Russian counterpart, Vladimir Putin. The two countries, Xi said, should jointly direct relevant mechanisms to deepen cooperation, take effective measures in tackling such challenges as terrorism and drug trafficking and maintain regional security, so as to enable the SCO to play a bigger role in safeguarding the common interests of all countries in the region. Xi suggested the two sides take the SCO as an important platform to dovetail China's Silk Road Economic Belt initiative with Russia's aspiration under the Eurasian Economic Union framework, expand room for their practical cooperation and facilitate development, cooperation and prosperity of the whole Eurasian continent. Xi recalled his last meeting with Putin in May when the two heads of state jointly attended the celebrations in Moscow marking the 70th anniversary of the victory of the Great Patriotic War and called for global efforts to safeguard the results of the WWII victory and international justice. He added that back then they agreed to connect China's construction of the Silk Road Economic Belt with the development of the Eurasian Economic Union, prioritizing cooperation in such areas as investment, finance, energy, aviation, space, construction of high-speed railways and other infrastructure, and the development of Russia's Far East region. Now, Xi noted, the host of important consensuses he and Putin reached are being carried out by relevant departments of the two governments, and tangible results have already been achieved in some new cooperation fields. Noting that China and Russia enjoy strong complementarity in economic structure, assorted cooperation areas and enormous markets, Xi called upon the two sides to deepen their economic and trade cooperation, continue to vigorously improve trade structure, explore new sources of growth, speed up the implementation of strategic cooperation projects and build high-quality platforms for their cooperation. The two neighbors should strengthen people-to-people exchanges and cooperation, and earnestly prepare the China-Russia Year of Media Exchanges program, so as to boost mutual understanding and friendly cooperation between their media setups, Xi said. China attaches great importance to the upcoming seventh BRICS (Brazil, Russia, India, China and South Africa) summit, Xi stressed. He urged all parties to cement cooperation with stronger confidence and jointly work for a closer, more comprehensive, and firmer partnership among BRICS countries. China endorses the positive signals sent by the BRICS nations to the world that they will safeguard the results of the WWII victory, promote world peace and security and push forward the democratization of international relations, as well as their important role in improving global governance and reinforcing multilateralism. The BRICS countries, Xi said, should beef up economic cooperation, step up the establishment of the New Development Bank and the Contingent Reserve Arrangement and jointly forge a community of common interests. Xi also suggested the BRICS nations maintain close coordination on major issues concerning global governance, including the post-2015 development agenda, climate change talks, the International Monetary Fund reform, counter-terrorism and cyber security, in a bid to safeguard the common interests of emerging markets and developing countries. 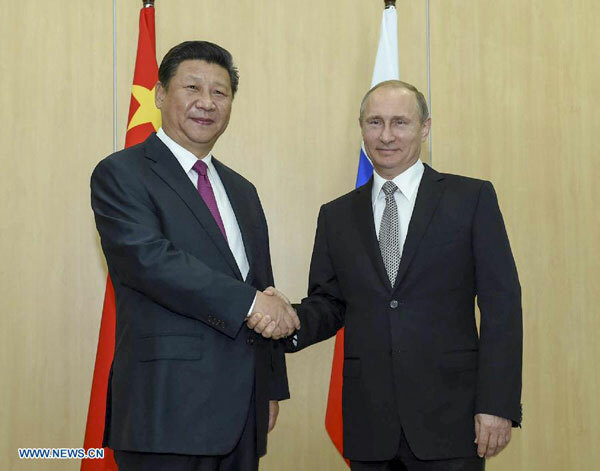 Putin, for his part, said he was delighted to receive Xi in Ufa only two months after their last meeting in Moscow. The comprehensive strategic cooperative partnership between Russia and China has been going through in-depth development, featuring closer exchanges in all sectors and positive cooperation in international affairs, Putin said. The economic and trade ties between Russia and China have become increasingly important, said Putin, noting China has become Russia's largest trading partner and the two sides have made further progress in cooperation in financial sectors. Stressing that Russia has been actively involved in the preparatory work of the China-initiated Asian Infrastructure Investment Bank, Putin said the two countries have witnessed steady progress in their cooperation in infrastructure, energy, space, new and high technology, and other areas. The decision to align China's Silk Road Economic Belt initiative with Russia's aspiration under the Eurasian Economic Union framework will surely instill strong momentum into bilateral economic cooperation, said Putin. People-to-people exchanges between Russia and China help promote mutual understanding and friendship between the two peoples, the Russian leader said, while echoing Xi's call to make good preparation for the Year of Media Exchanges program. Putin proposed that Russia and China beef up coordination within the SCO and BRICS frameworks, so as to jointly enable the two blocs to promote unity and cooperation among the member states and play a key role in issues of their common concern. Speaking at a press briefing in Ufa, Gui Congyou, deputy director-general of the Department of European-Central Asian Affairs of the Chinese Foreign Ministry, said Xi and Putin exchanged their views on global and regional issues of common concern. The two leaders, Gui added, agreed to strengthen bilateral cooperation in various fields and keep the comprehensive strategic cooperative partnership between their countries running at a high level. Xi arrived in Ufa, capital of Russia's Bashkortostan Republic, earlier Wednesday to attend the seventh BRICS summit and the 15th meeting of the SCO Heads of State Council. China and Russia should take the Shanghai Cooperation Organization as an important platform to dovetail China's Silk Road Economic Belt initiative with Russia's aspiration under the Eurasian Economic Union framework, Chinese President Xi Jinping said on Wednesday.